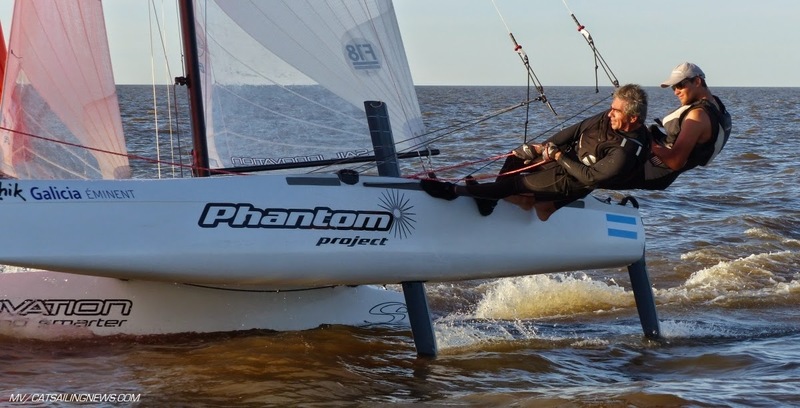 Image: Volker&Daneri - Some weeks ago two Argentine crews went storming the US Nats 2014, several bullets and great performance for both teams, Smith-Heuser were 2nd only after racing was cancelled due to lack of wind, as were winning all in calm weather racing. So you must think they came here and gave a bullet fest in our local fleet right? Not the case, and not cause they aren´t that good, in fact they are top 1-2 historical crew here, currently holding 3rd place in this Nats and can win in the end, but our fleet is super competitive. Today we had a low start waiting 2 hours for wind , that finally came in, 4 races held in tricky 1 trap to full floating , strong current conditions where former Opti World Champ Agustín Krevisky, with Billy Lopez Segura as crew, and former 420 World Champ Pablo Volker, sailing with 57yrs old super crew Esteban Daneri, battled for the lead. Some scores need to be updated that will modify top 2 order, but either way the two are leading the pack. I'm racing with a rookie ex mono/dinghy sailor Leandro Marquinez, he invited me to helm as his brother was working abroad delivering some top notch Juan K yacht, he is crewing and learning fast, past weekend he could trap downwind for the first time on an F18, on a 16knots perfect SouthEast with high chop, I told him: "You bought an F18 for this... and I left the IT office for this too!!" He was Nuts with the boat and the F18 sailing, his recently bought Infusion 2009 with long daggers is still super competitive (09 is one of best Inf build series too) and we managed to score a decent 6, (The Inf 09 has speed for better final perf) in the last race ahead of the US Vice Champs. As always great competitive racing in the F18, Event continues tomorrow and on Monday.